One of the very common tendencies that can be noticed in nosework trials in Poland, is the excessive interference of the handler in the work of the dog – overhandling. What does overhandling mean, why do handlers fall into this trap? 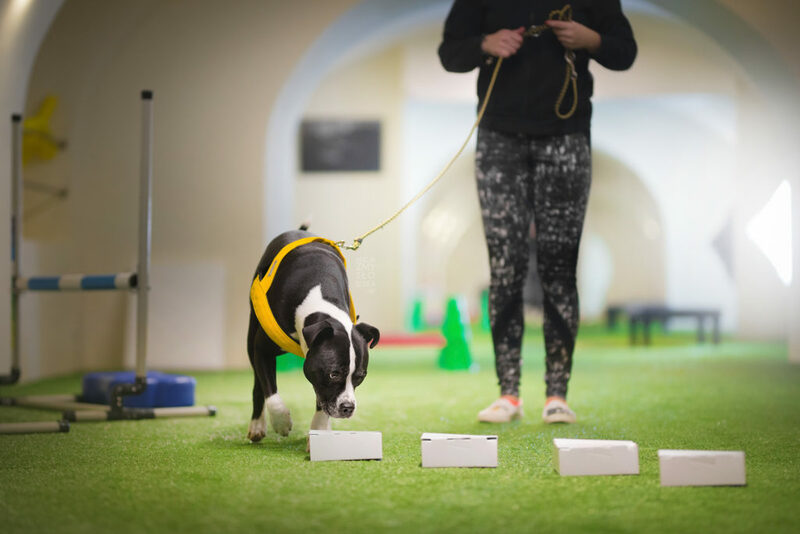 First of all, in nosework dog should work independently, handler has to perform the role of a strategist, making decisions only in situations where the dog does not have enough information to solve the puzzle, without human interference. This canine nose is an expert in the scent sport, and he is the one solving the puzzle. Why do we see overhandling? – mostly from poor preparation. From jumping through the learning stages too quickly. Most of the dogs whose handler use excessive handling already work on multiple hides, inaccessible hides. When they really need to polish the foundations and basics for a long time. Paraphrasing Ken Ramirez, “advanced training is nothing else but basics mastered to perfection”. We often forget about this, because we are attracted by the magic of blind searches and competitions. The work becomes sloppy, the dog is frustrated, handler does not learn how to communicate properly with the dog, and does not learn how to work on the ring. The Perfect Team is a dog that works independently, and a handler who watches over issues not available to the dog: boundaries of the ring, number of hides, reading COBs and alert behavior. Subtle communication, clear cues that allow you to guide your dog around the ring borders is what handler should master. Handler that plays a central role in the search process, a dog awaiting guidance from the handler on what to check and when. Permanent redirecting and showing areas to search, pointing to almost every object dog is supposed to check. It not only disturbs the independent work, but also can disturb the air flow and change the arrangement of the scent cones, making the dog’s work difficult. Very often in small rooms, handler even blocks the dog’s access to the cones and prevents work. A definitely better picture presents itself even with a handler standing on the start line and observing the dog from a distance, than the person walking two steps behind the dog, constantly pointing the places to be checked. If the dog does not work effectively without our help, it means that our criteria, our way of teaching is not clear. Fluency at work is a combination of precision and speed. In nosework it equals the dog that has the skills necessary to solve a given puzzle. – setting too high requirements and unmatched criteria. When we gradually work on particular skills in scent work, our learner should solve the puzzle without any problems. Hide selection, in terms of both the level of difficulty and training goals, should focus on the broadening of the dog’s skills. It is not an art to arrange searches where the dog has a problem with finding the hide. The trick is to put together such puzzles, which the dog can solve using already acquired skills, and expanding its repertoire with more. We do not want the search to be excessively difficult, and the dog being unable to solve the puzzle by himself, turning to the handler every step of the way. The handler in such situation resorts to excessive handling, consisting of showing, touching every inch of an areas to search, trying at all costs to make the dog find the hide. We resort to tricks that can end the search with an apparent success. Apparent because the dog does not acquire new skills of solving puzzle, but only learns to turn to us for help. The problem arises in competitions when the handler does not know where the hide is. This leads to repeated cues, crowding the dog, pulling the line, which disturbs the dog at work, and additionally discredits the meaning of the cue, but also puts pressure on the dog. – redirection to the environment. These are behaviors that allow them to receive a negative reinforcement. They allow them to escape from the aversive stimulus that is increasingly pressure from the handler. – misunderstanding of the specificity of sport. Nosework is based on working on scent cones. To a large extent, this differs it from professional detection work, where the smell is very well contained in the first place. Although even there, there is already a big shift in the direction of independence of searches. Even recently, I had the opportunity to talk to narcotic search dog’s handlers and they clearly indicated that the dog has to check the area by himself. Only possible omission of certain places requires the work of a handler. In nosework, the odor samples are never sealed, practically always hides are aged (which encourages the diffusion of the odor particles and the scent dispersion in a given area) which makes it “scentable” from a greater distance. The dog very often encounters a scent cone much, much further away than its source. After finding a cone, he begins his work on solving the path to the source. When handler interferes, it also disturbs the scent cone itself, making it more difficult for the dog to reach the source. What is the effect of excessive handling? Most often when there is overhandling, and the dog alerts, the handler does not call alert because… he was overhandling and now is not sure if it is not a false alert. It’s a vicious circle. Since we are guiding the dog, we decide what, where and when the dog sniffs, when the dog gives us alert, why do we not call it? When I ask this question after the search, I often hear, that the handler does not know if he hasn’t „persuaded” the dog to alert. Also common in overhandling is pulling the dog away from the source. Not paying attention to what he does, not reading changes in behavior and stages of solving the scent cone. It gets worse when there is no clear final alert behavior, or if there is none on purpose – lack of skills to read the dog. – making dog’s work harder and false alerts Very close proximity of the handler is also the reason for false alerts. 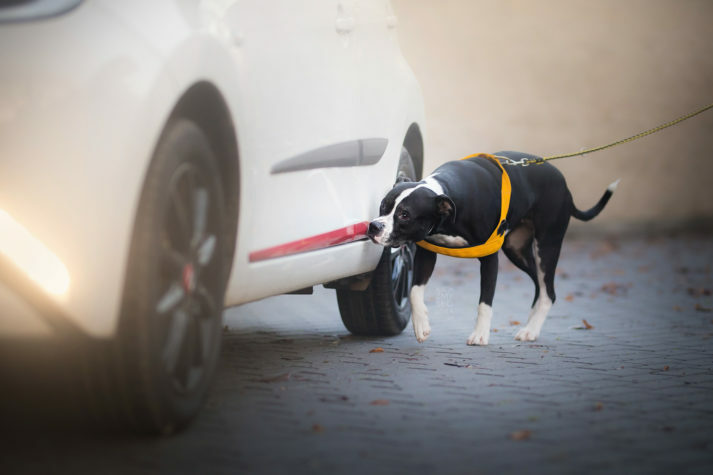 Because when the puzzle is too difficult, the dog turns towards the handler for help, who begins to indicate the areas to search, which reinforces the behavior of the dog, and automatically strengthens the redirection to handler. Very often in the case of blind searches this ends with a false alert. This time, the handler doesn’t know the location of the hide, therefore he redirects to the next objects and areas, placing more and more pressure on the dog. The dog can’t get the reinforcement by finding a hide, so he resurges to behaviors that previously were reinforced. And one of them is alert behavior. Trust your dog and your training. If you do not trust the training, then something is wrong with it. First of all, do not rush, nosework is not a race, it’s better to work on single hides for a longer time and do it well, then after three weeks of training go for ORT’s and then in two months try NW2, because it will never be without consequences. It is with much greater pleasure that I watch the NW1 searches or ORTs where the dog works efficiently, quickly and reliably than the NW2,or NW3 which truth to be told makes both handler and dog uncomfortable.